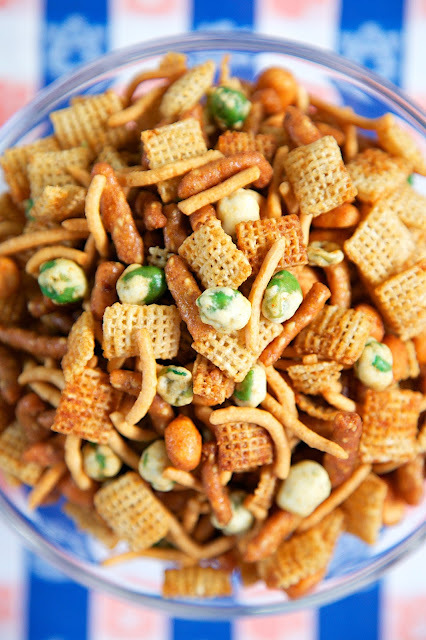 Asian Snack Mix - rice chex, sesame sticks, wasabi peas, chow mein noodles, honey roasted peanuts tossed in butter, soy sauce, ginger, garlic and cayenne - this stuff is crazy addictive! Can make ahead of time - it keeps for a week. Always the first thing to go at parties! Everyone asks for the recipe! Next week is a big week in college football. It is the first game of the playoffs! Woohoo! Not only are there huge college games, it is also New Year's Eve. BIG night! BIIGG night!! We will be staying in to watch football and avoid the drunks on the road. I'm already planning out our menu. 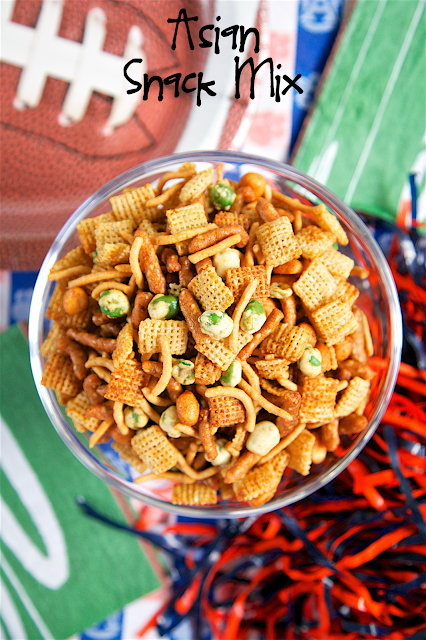 I am thinking we might just do a big spread of football snacks. 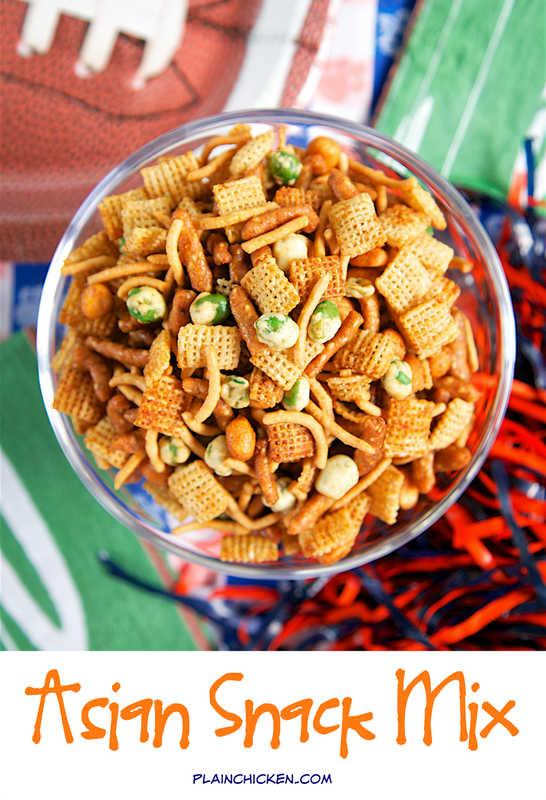 One think I know that we are having is this Asian Snack Mix. It is SO good! It has tons of great flavor!! 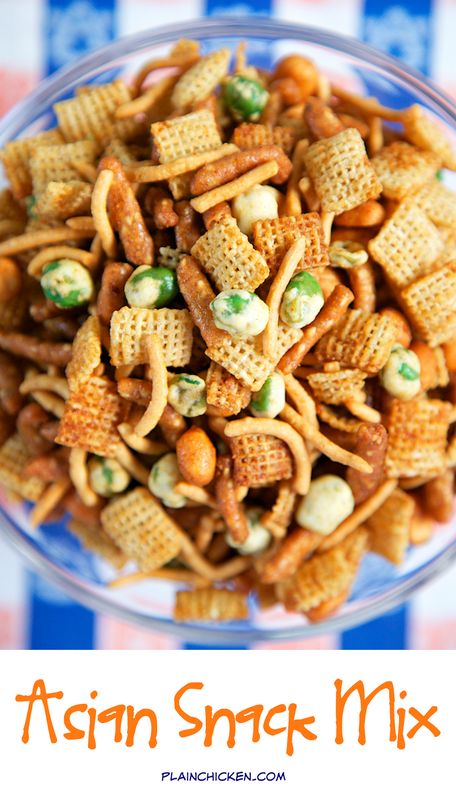 I love all of the ingredients in the mix, especially the wasabi peas and honey roasted peanuts. YUM! In a large bowl combine cereal, sesame sticks, wasabi peas, chow mein noodles and peanuts. Whisk together melted butter, soy sauce, ginger, garlic powder and cayenne pepper. Pour over cereal mixture. Toss to coat thoroughly. Spread mixture on rimmed baking sheet and bake 45 minutes, stirring every 15 minutes. Let cool completely before serving.